In your library's digital collection, click or tap , then select Recommendations. Click or tap Dismiss beneath a title to remove it from your Recommendations list. 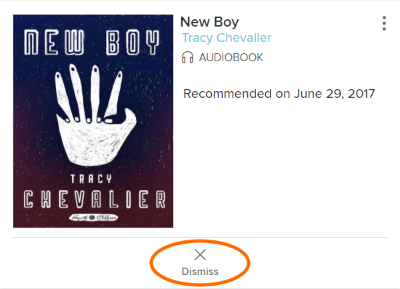 Note: Dismissing a recommendation doesn't remove it from your library's records or increase your recommendation limit. If the library purchases the title you recommended, you'll still receive a notification email.